or flopping in the air. You can say that it is weight forward. 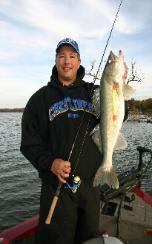 scare the fish in shallow water like other bobbers and floats. 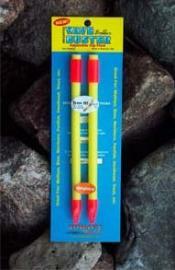 The Wave Buster has Unbreakable foam and plastic parts. 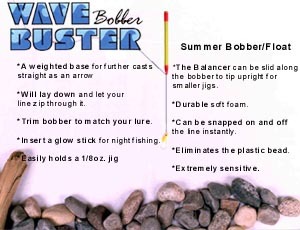 base, the bobber will then tip or stand upright. (they call this a tattle tail). resistance after they strike and start moving with the bait. is a string stop knot). 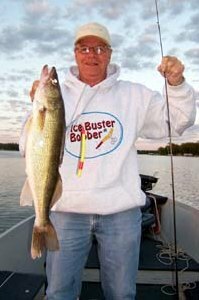 tangling or the casting ability of the Wave Buster. jig is off the bottom). make it as sensitive as you need. similar object, you can then insert a glow or light stick (preferably 3mm. thick) for 9hrs. of night fishing. To Order 10 Light sticks click here. depth to get your bait off bottom. stop knot contacts the slotted hole. when stepped on or bent.